Eat Fat, Get Thin: How Fat Makes Life Better! - Kindle edition by Piera Bonventre. Health, Fitness & Dieting Kindle eBooks @ Amazon.com. It's time to debunk the myths and lies around one of the most controversial nutrients in the weight loss industry- FAT! Fat is not the enemy. The diet and weight loss industry has lied, manipulated and deceived you into thinking eating fat, makes you fat. This book is not a diet book and it won't sell you on any pills, gadgets or memberships. You will get the latest facts in fat nutrition that will enable you to lose any excess weight, stay lean and energize your whole body easily and without deprivation. It isn't about cutting out food or food groups. It's about keeping the ones that will give you rocket fuel energy to sustain every activity and goal you desire. You will think with better clarity, work out with stamina and sustained energy and get leaner every day when you eat the great fats listed inside. And by the end of this book. I reveal one of the most potent and health giving fats on the planet. This mystery fat once ingested will have you thinking sharply, reducing your cravings and waking up each morning full of vibrant energy and stamina. What are you waiting for? Let's eat fat and get thin ! This book contains 86 pages of material, lists, and resources. This is a common sense book. Just eat the way most people did before processed foods and in moderation. This is how my mother prepared our meals. 1.0 out of 5 starsIts good to eat fat! The directions were specific. However there was little justification for the advice. It is difficult for the layperson to know why this advise is any more correct than all the other diet or nutritional advise she criticizes. Nonetheless, as a scientist, I concur with her advice, but wish she was more compelling. She needed to give sources of medium chain triglycerides (MCT), since that was her savior. Instead she suggested supplementation, which is somewhat inconsistent with her whole food mantra. The most informative way to eat what God has given us. Which is what I have been telling people for years. 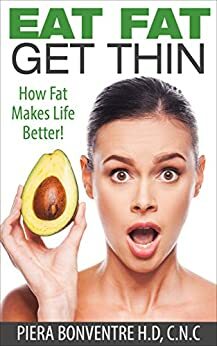 This item: Eat Fat, Get Thin: How Fat Makes Life Better!